It now seems certain that dividend tax increases are on the way starting in 2013. The point of this post is not to argue the wisdom (or lack thereof) of a dividend tax increase from a fiscal standpoint, so I won't add to that discussion here. Instead, I want to explore how tax rate changes could affect corporate distribution policies, especially if dividend tax rates end up being higher than long-term capital gains tax rates. 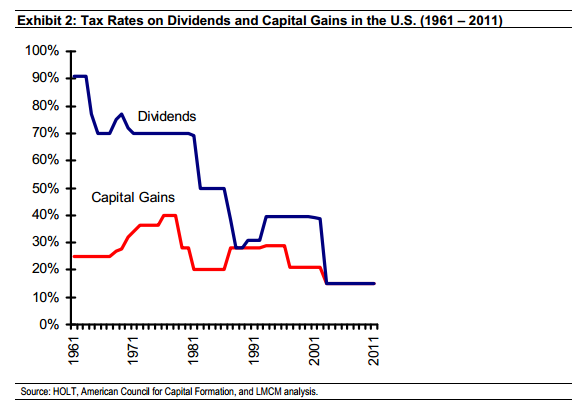 Recall that in 2003, tax rates on qualified dividends were lowered to 15% and, more importantly, were brought in-line with long-term capital gains tax rates for the first time in many years. The initial effect of the equalized tax rates, according to a paper by the National Bureau of Economic Research, was that "firms adjusted their distribution policy (specifically, dividends versus share repurchases) in a manner consistent with the altered tax incentives for individual investors." Indeed, it stands to reason that another tax change in 2013 would similarly impact buyback and dividend policies. 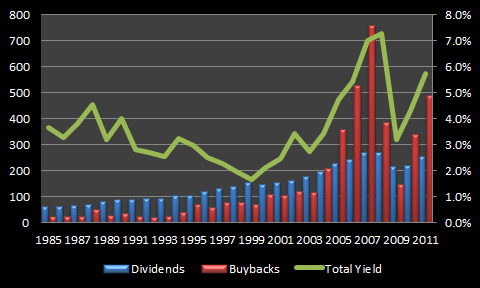 Despite the reforms that reduced the tax disadvantage of dividends, buyback activity has actually surged since the end of 2003 and has trumped dividend payouts 1.68-to-1 through 2011. We've previously discussed the reasons why buybacks can be more attractive to management teams, but investor preference for lower tax rates on capital gains cannot account for the boom in buyback activity since 2004 as tax rates have been equal over that time period. That might change starting next year if no legislative effort is made to keep dividend and long-term capital gains taxes the same, as it would re-establish the tax disadvantage of dividends. Don't get me wrong -- I do not think that companies will stop paying dividends or stop increasing their payouts in a higher and unequal tax rate environment. Far from it. It's entirely possible in such an environment, however, that relatively lower taxes on capital gains could add more fuel to buyback activity. 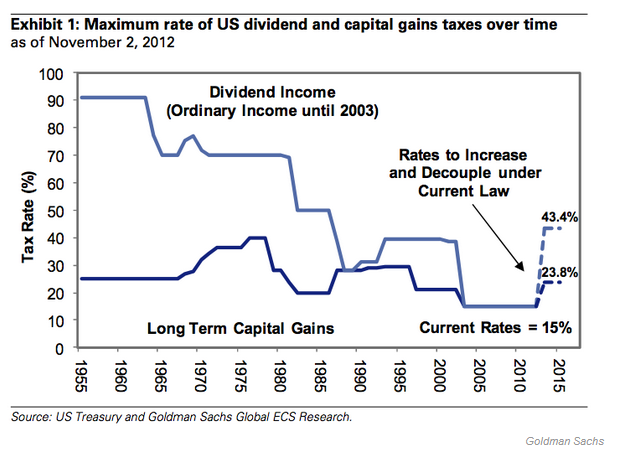 If that's the case, dividend growth rates may be lower than what they might have been in an equal tax environment. It's also possible that some younger companies that might have considered paying a small dividend in an equal tax environment may opt to focus on buybacks instead. 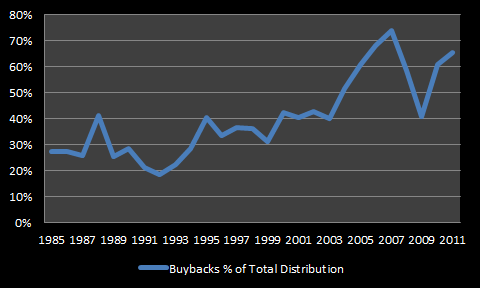 It will be interesting to see how it plays out, but unless Congress keeps tax rates on dividends and long-term capital gains the same (even if they are both increased) I expect to see buybacks continue to account for the bulk of total distributions. First off, thank you to everyone who has already taken a look at the Dividend Compass spreadsheet (which you can view and download for free by clicking here). If you haven't the faintest idea what I'm talking about -- a forgiveable oversight :) -- here's an earlier blog post that explains the Dividend Compass and how it works. Also, a special thank you to those of you who have provided valuable feedback on the Dividend Compass -- in particular to Pablo, who noticed a broken formula that has since been fixed. Since we're nearly finished with 2012 (hard to believe! 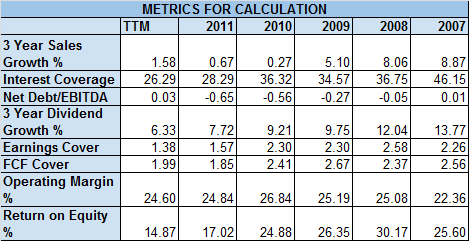 ), I've added a column for trailing-twelve month (TTM) figures so the data is as fresh as possible. Today, I'd like to illustrate a few ways in which you can use the Dividend Compass to notice trends in dividend health and growth potential. The default company in the Dividend Compass is Johnson & Johnson* (a stock I own), which also happens to be a great example for trend-spotting. Setting aside the weights and final score aside for a moment and focusing on the line items, we can quickly recognize a few trends. On the positive side, operating margins remain solid, the balance sheet (based on interest coverage and net debt/EBITDA) remains in excellent shape, and the dividend looks sustainable on a free cash flow cover basis. Unfortunately, the negative trends appear to outweigh the positives. Sales growth, dividend growth, earnings cover, and return on equity have all declined by at least two full Dividend Compass points since 2008. Recognizing these trends helps us focus our research. The negatives may or may not be as bad as they seem, but we do need to dig a little deeper to determine if the trends are genuine concerns. On the slowing sales growth issue, JNJ has been adversely impacted by a few drug patent expirations, but relative to other major drug producers facing patent cliffs, JNJ's top-line isn't all that bad. JNJ's top-line has also been supported by consumer healthcare and medical device businesses. Still, the slowing growth is an issue to consider. The declining earnings cover and ROE issues are linked as both metrics have been driven lower by the substantial litigation, product recall, and write-down expenses the company has taken over the past two years. Excluding "one-time" charges like these, management expects 2012 adjusted EPS to be $5.05-$5.10 per share, which would equate to dividend cover near 2.1 times and implies an adjusted ROE of approximately 22-23%. In this light, things don't look quite as bad as the Dividend Compass score might suggest as the data is based on reported results and not adjusted results. There's reason to believe that these expenses won't be recurring items, but the substantial charges have nevertheless impacted results as evidenced by slowing dividend growth and JNJ's relative under-performance over the period -- since the end of 2008, JNJ's share price has trailed the S&P 500 by 34 percentage points (SPY: +69.5%; JNJ: +35%). However you view them, these one-time expenses matter and should be fully considered. Whether or not you think there's cause for concern in this particular case, the Dividend Compass has helped us identify trends that required our attention. In some cases, we may find there's not a good explanation for the trends we see and that could be a sign to stay away or sell an existing position. Hope you're having a great weekend and thanks for reading! *This is not meant to be a full analysis of Johnson & Johnson nor is it an endorsement of the stock, but is meant to illustrate how the Dividend Compass can be used in your regular research. Further research is always necessary.